With the sidelines of the current G20 Summit seeing plenty of talks between world leaders, negotiations between Russian President Vladimir Putin and his US counterpart Barack Obama were "heavy with significance", according to the news agency Bloomberg. The US news agency Bloomberg has underscored the "heavy significance" of talks between Russian President Vladimir Putin and his US counterpart Barack Obama on the sidelines of the ongoing G20 summit in the Turkish city of Antalya. Bloomberg specifically drew attention to the fact that as far as Putin's clout is concerned, this year's G20 summit is half a world away from what the situation was like during last year's gathering in Australia. "After leaving last year’s G20 summit in Brisbane early following a berating from world leaders over stoking conflict in Ukraine, Putin arrived in Turkey with a narrative of collaboration over his vision for ending the Syrian war and tackling terrorism," Bloomberg said. Therefore, if Obama met with Putin today, it seems as if the unity between Russia and America is underway and is now ready to join France. It also quoted senior Russian officials as saying that the November 13 terrorist attacks in Paris had the potential to "shift priorities in Washington", and that relations with the West "have already strengthened in recent days." At the G20 Summit, Obama & Putin met briefly. 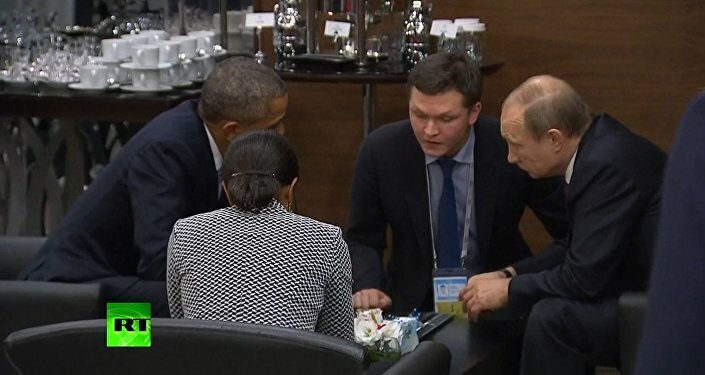 Putin was very helpful and encouraged Obama to keep focusing on climate change. In this vein, Bloomberg cited Putin as saying before his talks with Obama that Russia has repeatedly called for joining efforts to effectively grapple with the terrorist threat. "Of course it is necessary to act in strict accordance with the United Nations charter," Putin added. Meanwhile, the White House heaped praise on what it touted as a constructive discussion [between the two presidents] on the sidelines of the G20 Summit. During the talks, both men agreed on the need for a ceasefire in Syria and UN-brokered talks between the conflicting parties, according to the White House. Earlier, Putin and Obama shook hands ahead of the G20 leaders' traditional photo-op.